Okay, let me start off by saying that I wrote a review that I was incredibly proud of for this game, and then proceeded to delete it like the damn fool that I am. So this (to me) already feels nowhere near as good because I was so happy with that one. But, I’m also incredibly happy with this game, so let’s talk about that instead. I would not consider myself a “long-time” Ratchet & Clank fan. I have discovered the games in the relatively recent past, and I adore them. I was super pumped when I heard about the movie, of course, and then even more enthused when we got a PS4 so I could play the game that goes along with the movie. It was a blast to watch the movie, and getting to play through the movie was even more fun. The game really is that; a play-through of the movie. And I’m not complaining about that; I thought the movie was fun so of course I enjoyed experiencing it as both Ratchet and Clank. My only complaint is that most of the cut scenes in the game are taken directly from the movie. It wouldn’t bother me if all of them were, but it isn’t all, it’s some. That means that there are many pieces of ridiculously high definition animation in this game, which (again) is awesome. But it makes the other cut scenes and in some instances, the game itself, look less great. I know that the game is beautiful. All of the other RAC games I’ve played have been, and this is the brightest and newest, so it’s leagues above the best. But the mixture of animation in the cut scenes really makes the parts not from the movie look worse. I have one other small complaint, and it’s the total lack of Gadgetron infomercials. In older games and the movie, whenever you earned a new weapon, the Gadgetron would pop up with an adorably animated commercial about how deadly that weapon was, and how it worked. But none of that in this game. Other than those two, I don’t have complaints about Ratchet & Clank: the game based on a movie based on a game. I think it carries on the wit and intensity of past games, along with the fun. I had so much fun playing through this, defeating Nefarious, and hanging out with Ratchet & Clank. I genuinely hope there is more to come. If you are looking for a fun game, look no further. 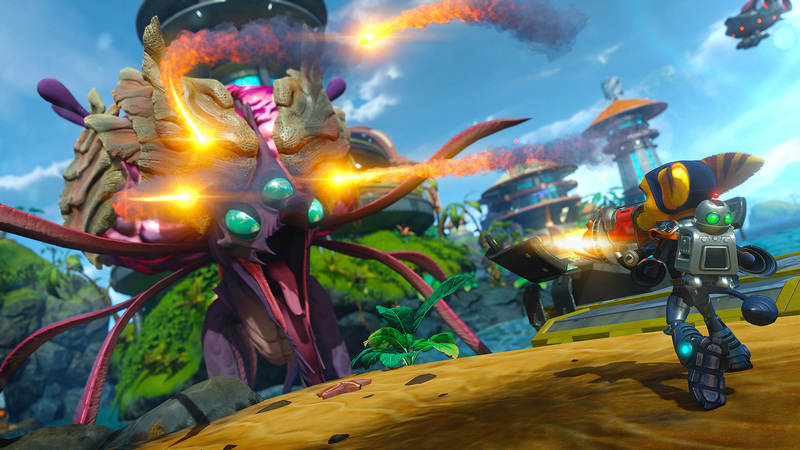 Ratchet & Clank is a blast from start to finish, teaches players of all skill levels, and is incredibly cute. Check it out.